The small desk scanner promised, “Organize your paper, simplify your life.” Well, I decided to test it out to see if it was indeed true. And, boy, was I pleased. The scanner arrived today via UPS and I immediately tore it open, ready to set it up. It looked simple enough - attach via USB, and good to go. I hastily went to plug it in, but was greeted by a “STOP!” sticker conveniently placed over the unit, reminding me to install the software (and read directions) before setting up the unit. Drats. But the unit came with an extremely easy installation guide, so I was up and running in no time. The most difficult part was my trying to figure out how to disable my anti-virus program. But the overall installation took four minutes, tops, and didn’t require a lot of work from me. Bonus points. The scanner is about 12 inches long and weighs perhaps a pound or two, so it easily found a place on my desk. 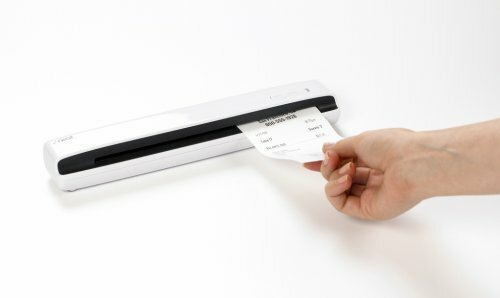 It also comes will a wall/desk holder that allows you to store the scanner upright when not in use, further saving you space on your desk. Space is good. software had filed the receipt into a personal expenses folder, noting that I paid $6.59 with no sales tax by credit card. Hmm, that was a little too easy. Let’s try tricking the program with a worn-out, crumbled, slightly torn receipt from Kohl’s. And in five seconds, I had a receipt on my screen, noting that I paid $107.35, with 65 cents in sales tax, in cash. Well, that wasn’t entirely true, but the receipt was misleading - it had two different tax lines, a discount line, and I paid with a Kohl’s charge. No biggie, because you’re easily able to correct the entries in the program. But I was impressed that scanner was able to tell the receipt was from Kohl’s, because that was the part that was torn. My next test was to see if the CVS and Kohl’s receipts would export easily to Quicken 2008. By clicking on the folder containing my receipts, I was able to quickly export the information into a *.qif file in one click. I opened Quicken, imported the file, and voila - a seamless transition from program to program. I just about jumped for joy, because I was tired of manually typing in every cash receipt into Quicken. This just made my personal budgeting 100 times - no, 200 times - easier. The next test was the business cards. As a journalist, I have quite a bloated Rolodex, so streamlining them onto the computer intrigued me. I picked five very different business cards with different orientations, colors and business logos. Let’s see if NEAT Receipts can handle that… and it did. Each card scanned perfectly into the system, with names, companies, titles, and contact information neatly organized into entries that can be exported into contact files, vCards, PDFs and more. The “Documents” featured worked as well as the other two features, and I am able to group the scanned documents into as many folders as I please. The PDF capabilities of the program make digitizing and sending these documents even easier. The software also has a “Tax Reports” feature that I have yet to use, but am sure will prove helpful once the dreaded month of April rolls around again. Overall, I give NEAT Receipts Professional a 10 out of 10. No longer do I have to enter information manually into budgeting software. No longer do I have use my flatbed scanner, wait 20 seconds for the document to scan, then save a document into a non-searchable *.jpg file. This product truly does what it says. If receipts, documents and business cards are taking over both your personal and business life, it will likely be worth your money, as well. a try. It has Tip Diva’s enthusiastic stamp of approval.